We survived the Snowmaggedon/Snowcapolypse where I live, where over 60 inches of snow has dumped on us in the past month and a half, an event that hasn’t happened here since 1901 according to records. Snowmaggedon ~ A friend joked this looked like a bunch of pregnant woman got snowed on while sitting around our firepit. 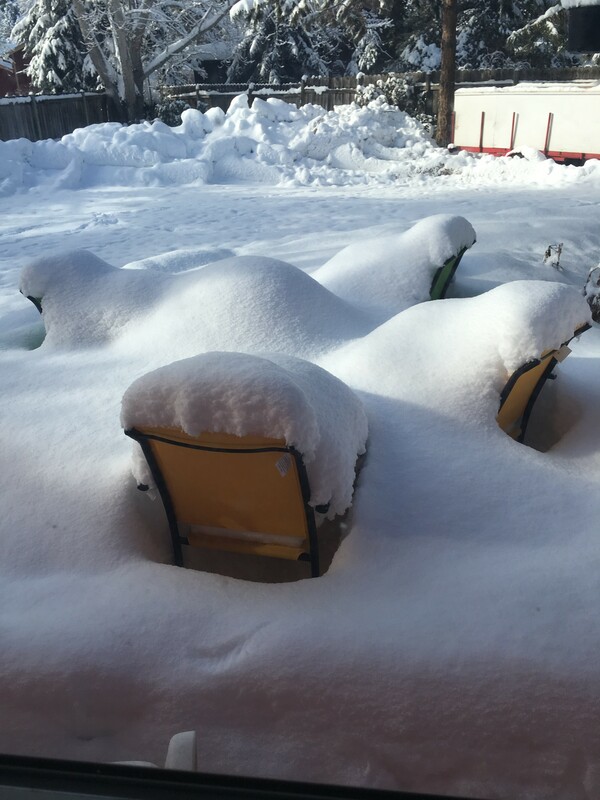 Those were empty chairs before the snow. We had a near tragedy, where a school’s gym roof collapsed entirely, but overnight when thank goodness nobody occupied it. In the morning it is usually teeming with kids waiting for the school bell to ring. It wasn’t discovered until all the kids had boarded buses for school, so all parents were notified to pick up their children immediately at all schools in town. Schools were closed for 8 days after that until all snow was removed from 38 school roofs (9 million square feet) and structures inspected and deemed safe. Whew! Dodged the bullet on that one! 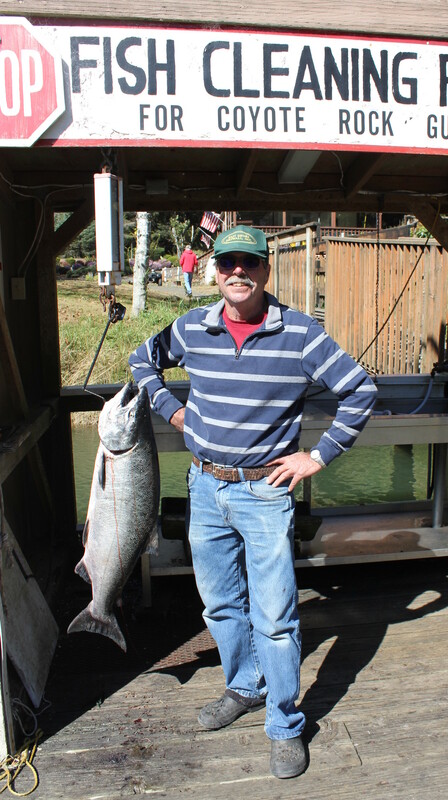 Snow or no snow, we certainly had to eat during this event, and here is one of the recipes I came up with during our snowbound days with what I had on hand. 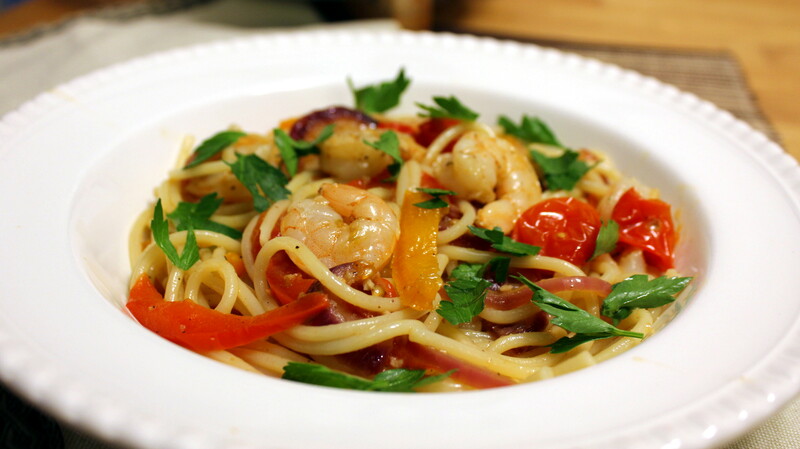 This is a thumbs-up recipe from the hubby, yay! My only regret is not making more sauce, so I’ve adjusted the recipe below for that. I served this over cooked rice. Nummy and warming! 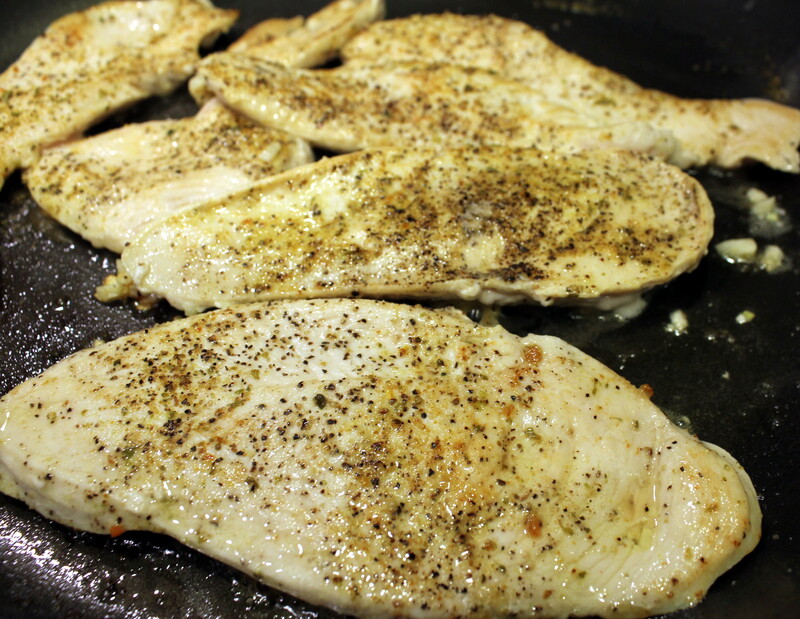 Preheat the oven to 400 degrees F. Slice the chicken breast thin, and season with the pepper and salt or Mrs. Dash. 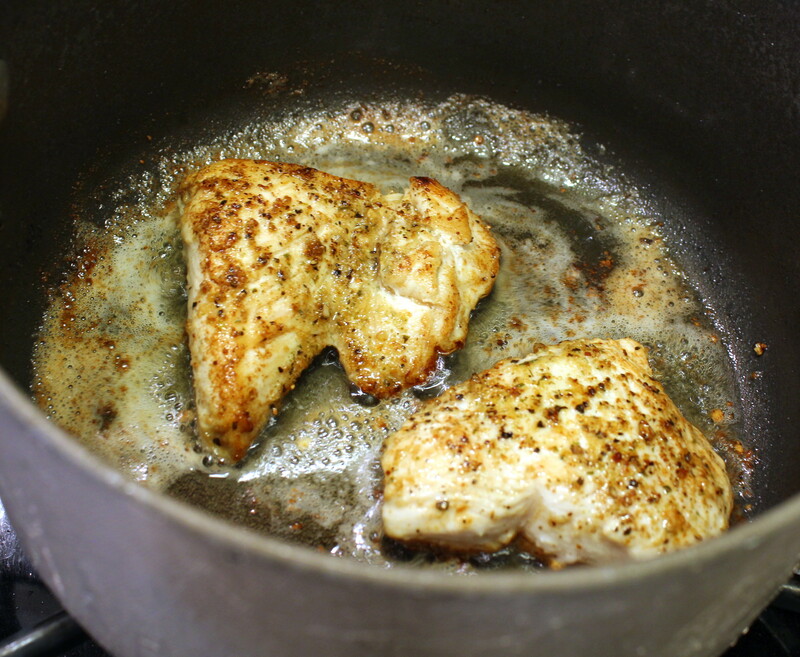 In a large skillet over medium high heat, add the oil and half the garlic and sear the chicken filets on each side until browned. Remove and set aside. 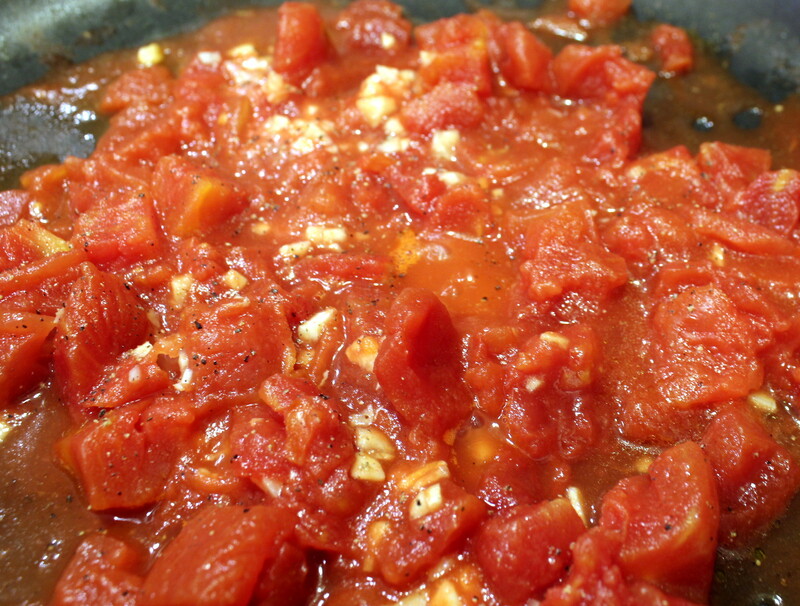 Add the drained tomatoes to the skillet along with rest of the garlic and simmer for a few minutes. Pour the tomatoes and garlic in the bottom of an oil-sprayed two-quart casserole. To the skillet, add the spinach and the rest of the butter plus a large pinch of crushed red pepper flakes. 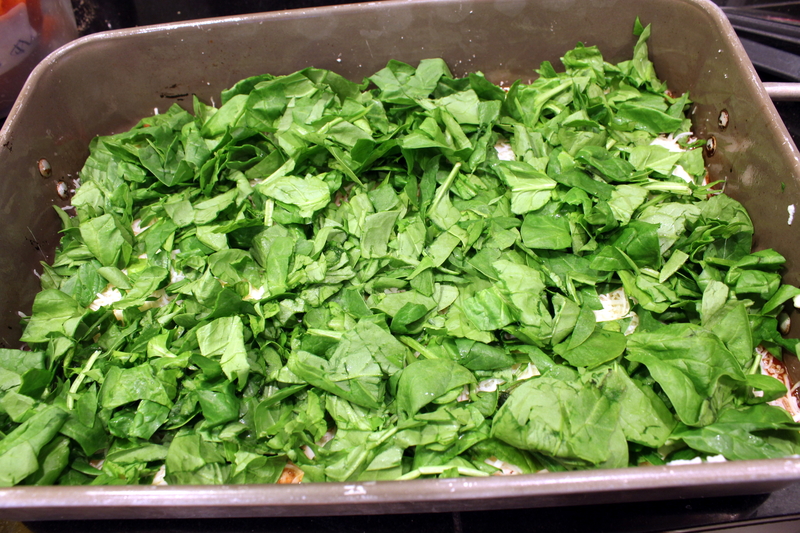 Stir until butter is melted and spinach is heated through and incorporated. Layer on top of the tomatoes. 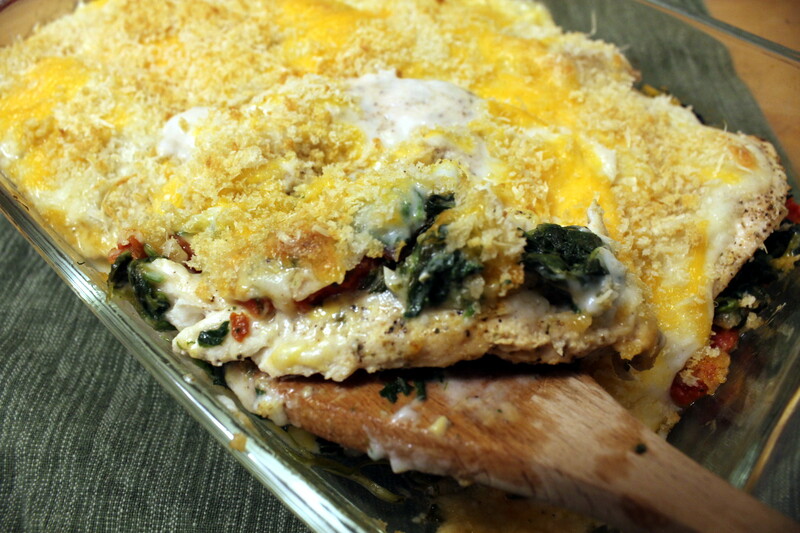 Next layer the chicken on top of the spinach. For the sauce, melt the butter in a saucepan and add the flour, mustard powder, and white pepper, whisking until a paste forms. 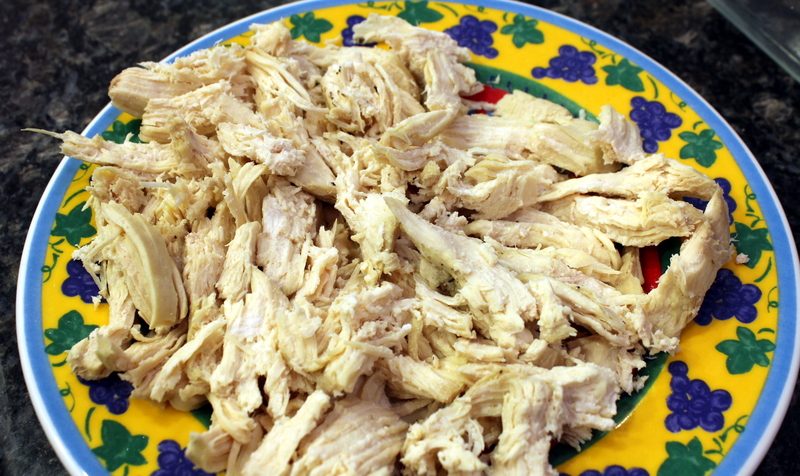 Pour in the milk and sherry or chicken broth, whisking constantly. 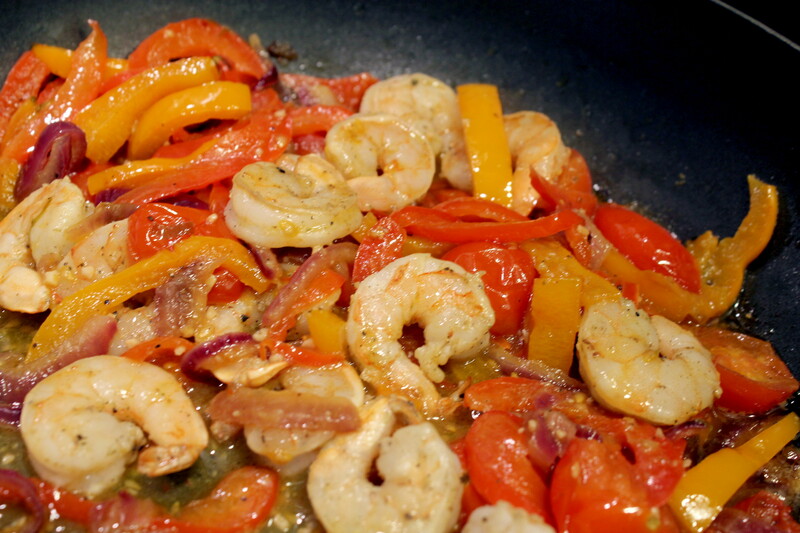 Simmer over gentle heat while stirring until the sauce is to desired consistency. Pour the sauce evenly over the casserole. 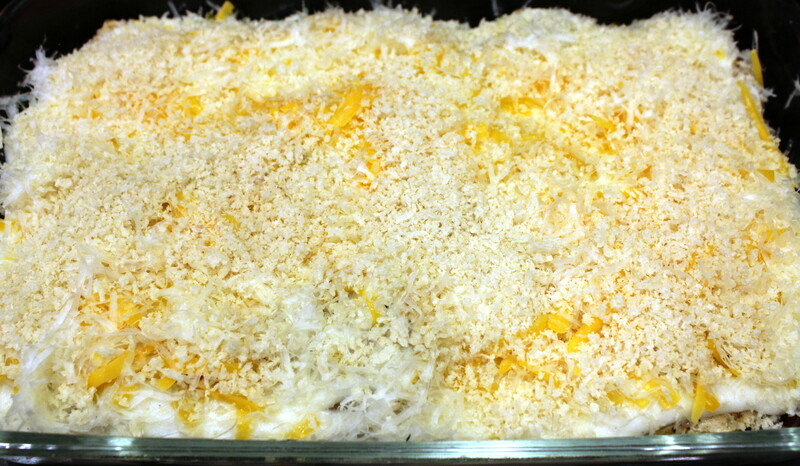 Sprinkle the grated cheeses over the dish, then top with the Panko breadcrumbs. 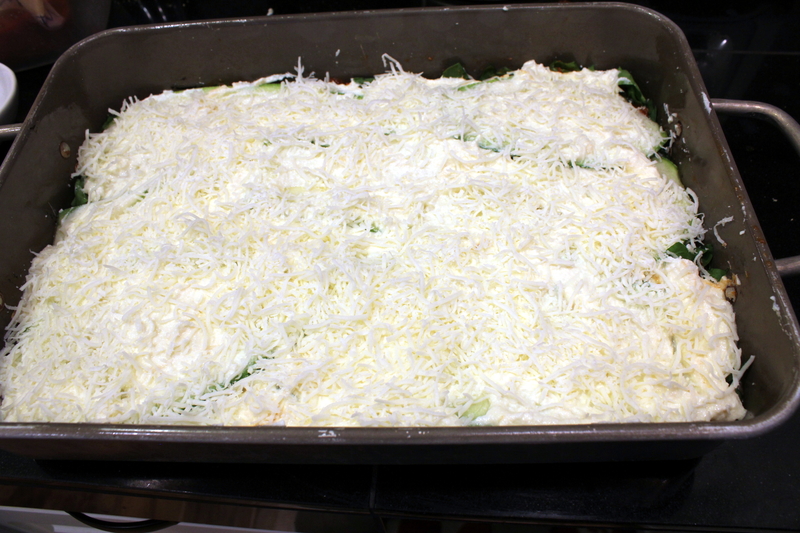 Bake for about 20 minutes, until casserole is heated through and top is browned and crispy. Serve over cooked rice or noodles. This soup has keeper written all over it! (Plus my hubby told me so.) I made this soup a couple of weeks ago, and the only photo I took while making it was from my iPhone, so sorry for the lack of prep photos. But who needs them when this is so quick and easy to make? 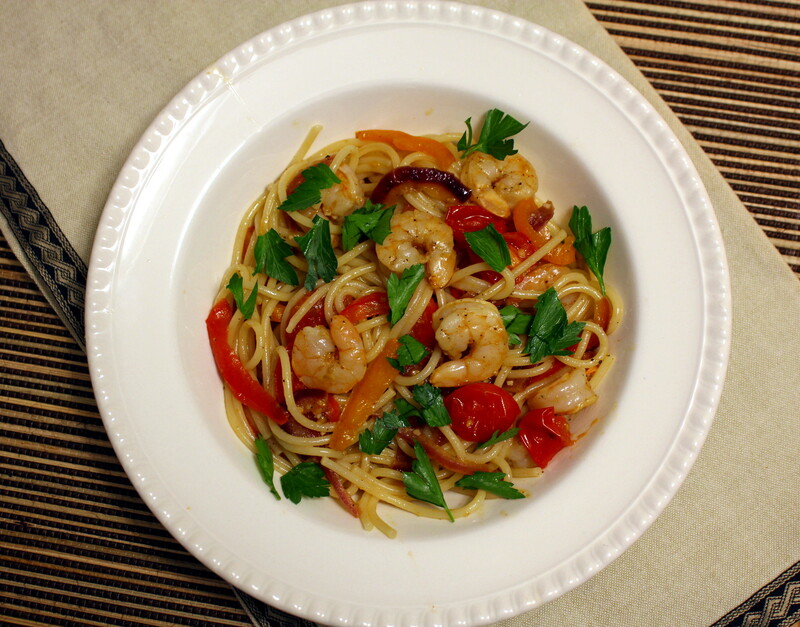 You can easily have this on the table in less than 30 minutes. 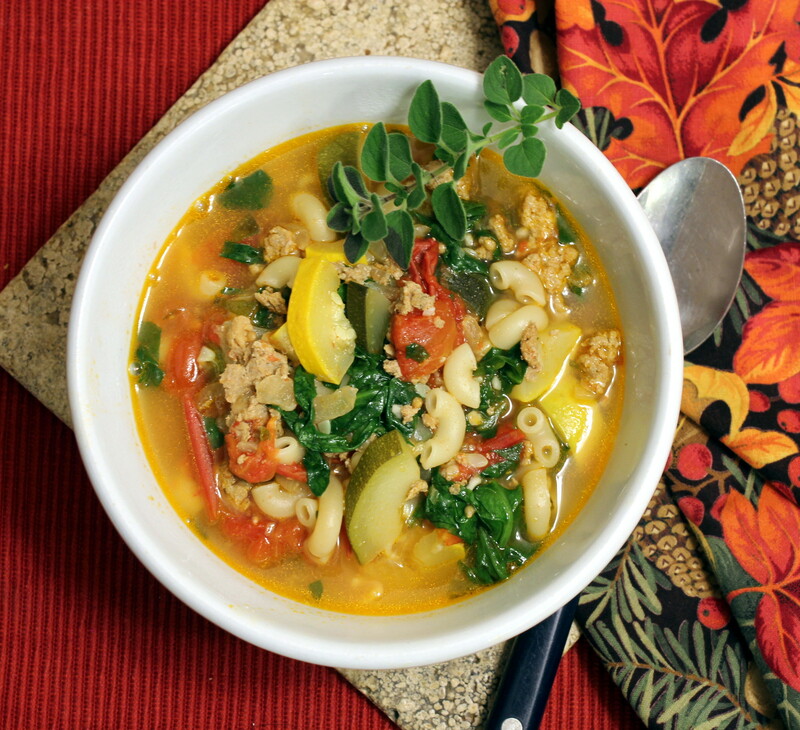 This soup is full of flavor, and hearty and filling enough to satisfy even the hungriest of eaters. Heat oil in a soup pot or Dutch oven over medium heat. Cook the smoked sausage and onion until sausages have slightly browned and onions are soft, about 5 to 7 minutes. Add the garlic in the last minute. 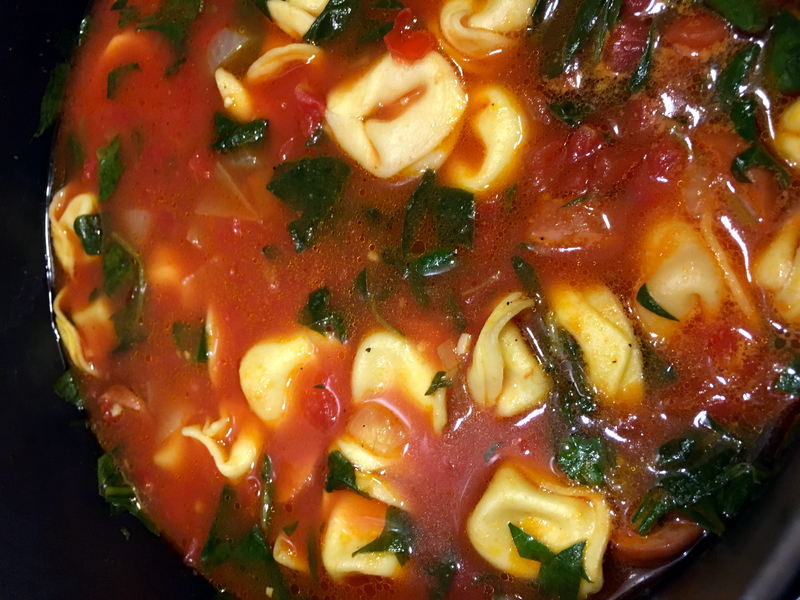 Stir in the tomato paste, diced tomatoes, turkey or chicken stock, tortellini, and pepper and bring to a low boil. 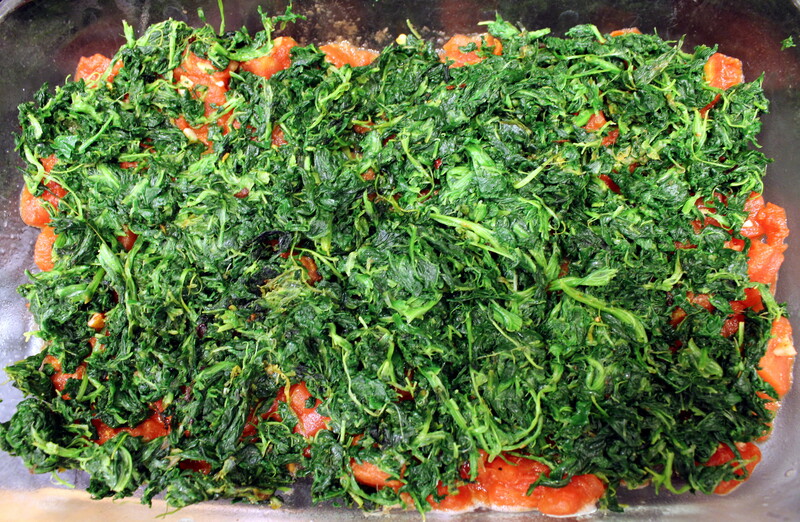 Reduce heat and simmer gently for 5 minutes, then stir in spinach and cook until wilted. 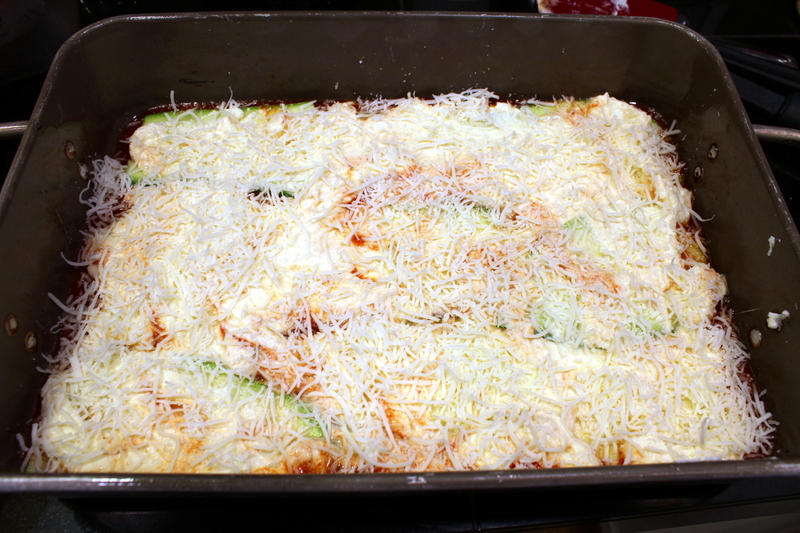 Serve with fresh-grated Parmesan cheese. 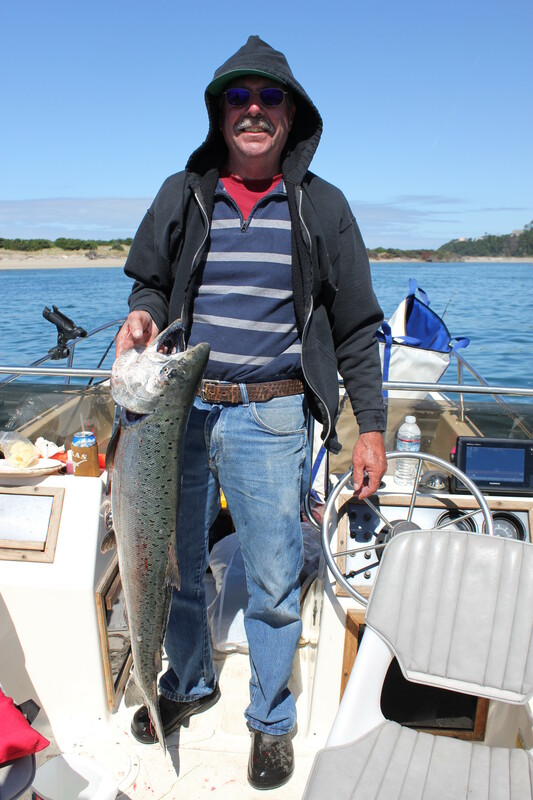 Garden Dump Soup ~ Plus a Wild-Caught Chinook Salmon! Our kindly neighbor in back gifted us with two giant zucchinis and a large summer squash just before we left on our trip to the coast last weekend. 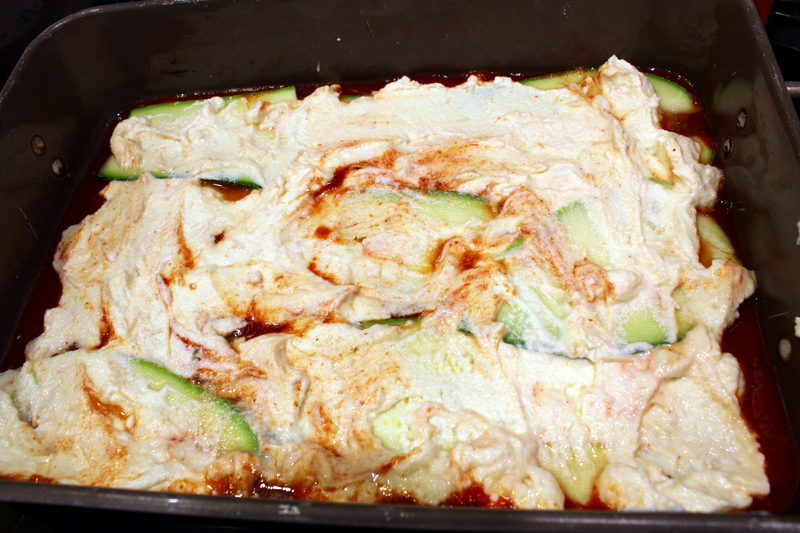 I packed the largest zucchini and my mandoline and made a huge pan of Zucchini Lasagna in our RV’s convection oven, so that made use of one. A couple days after we got back, I discovered the other zucchini and squash in the vegetable bin plus a half bag of baby spinach. 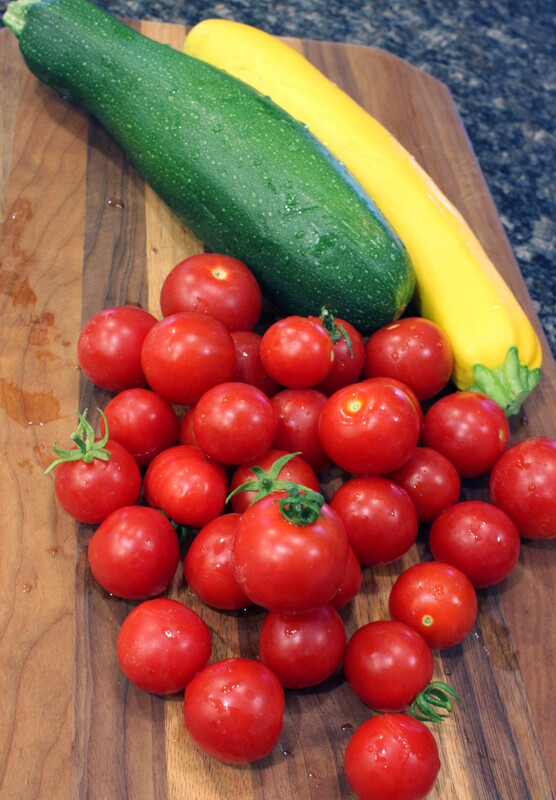 AND our tomatoes had gone gangbusters while we were gone! Soup was the only thing that came to mind where I could use that many veggies at once, so scoured our freezer for a bit of protein to go with it. I found a 1/2 pound of ground turkey, and about a 1/4 pound of homemade ground hot Italian sausage, which I figured needed using up anyways. Last, I grabbed a quart of homemade beef stock out of the freezer, as I had 6 quarts of that and only 2 quarts of chicken broth. Basically I chopped it all up, sauteed the veggies and meats, then threw the rest of it in a stock-pot with some seasonings and spicy oregano from gardening and voila! Garden Dump Soup. Maybe I should have called it Garden and Freezer Dump Soup? Also at the very end I tossed in a cup of elbow macaroni to thicken it up a bit. Either way, this wowed the hubs, who went back for second and thirds, and he kept asking me what I was going to call it for my blog. I finally came up with this name. 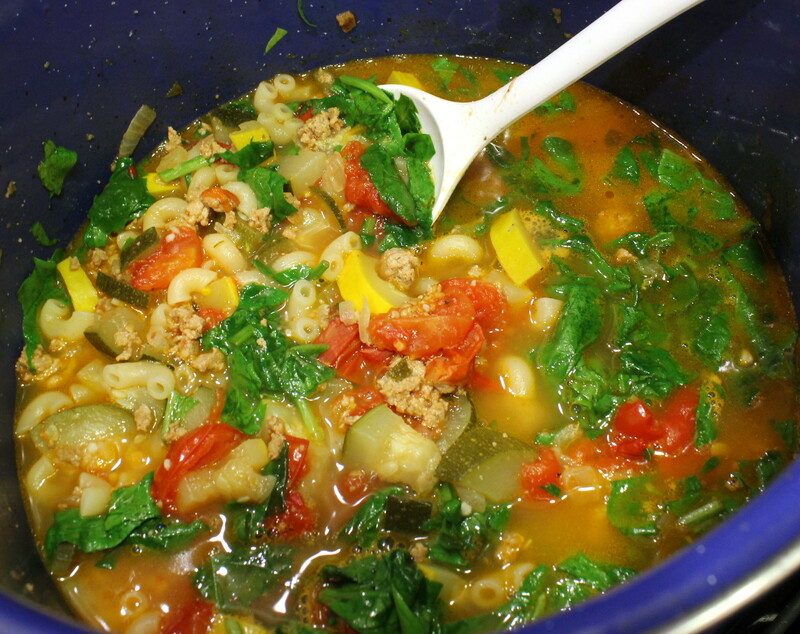 What’s good about a soup like this is you can use any vegetables you have on hand, your preference of broth, and any kind of ground meat and pasta. So versatile! If you don’t end up using any ground hot Italian sausage I would recommend adding a 1/2 teaspoon or so of dried Italian seasoning and perhaps a pinch of red chile pepper flakes. But that’s just me. 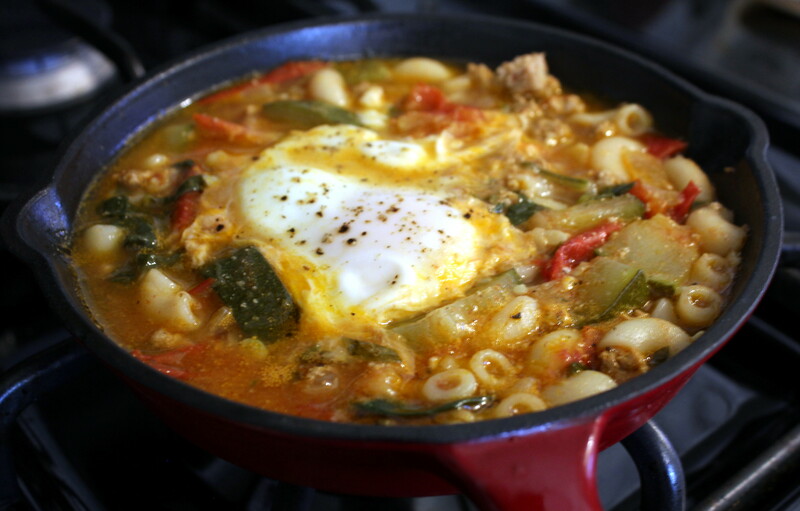 Even better, the next day I made myself a hearty breakfast (it was workout day) by plopping a farm-fresh egg into it and simmered it to perfection. Yay! Chop and mince up everything to prep. Add the oil to a stockpot or Dutch oven over medium-high heat. 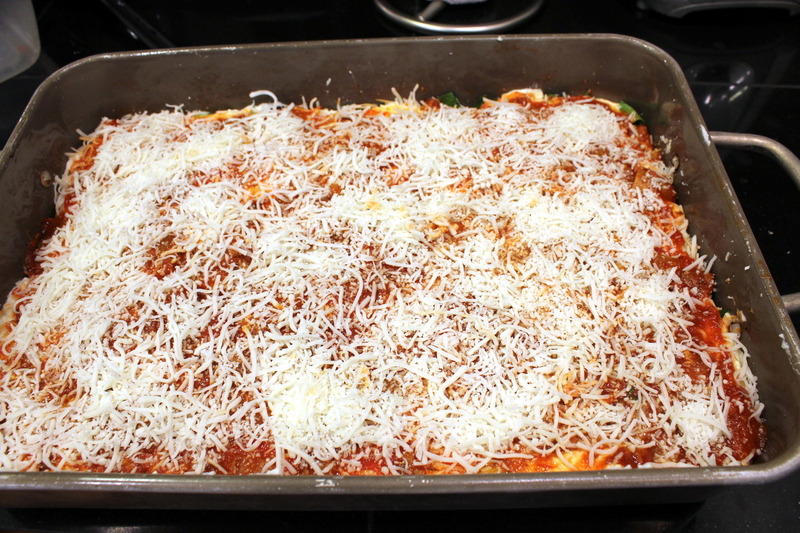 Add the ground meat, veggies (except tomatoes, and spinach if using), onion, garlic, and seasonings. Cook for about 15 minutes until the meat is cooked pretty much through. 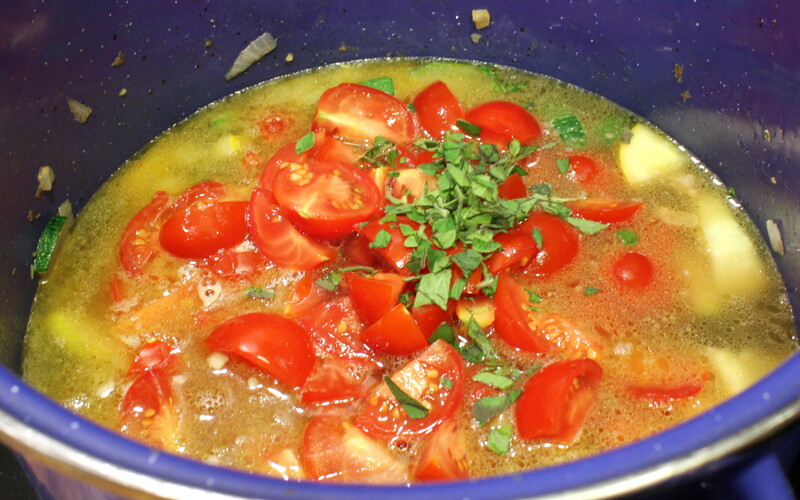 Add the stock or broth, tomatoes, and oregano plus other herbs/spices if necessary. Bring to a simmer, then add the elbow macaroni or other small pasta. 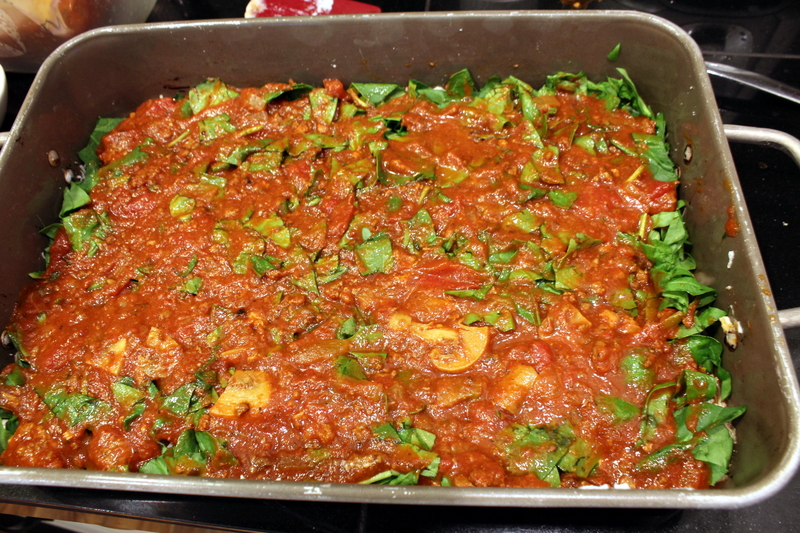 Simmer until pasta is done then add the chopped spinach (if using) and cook until wilted. Taste and adjust seasonings if needed. Serve in bowls with optional Parmesan cheese. Filling and super yummy! 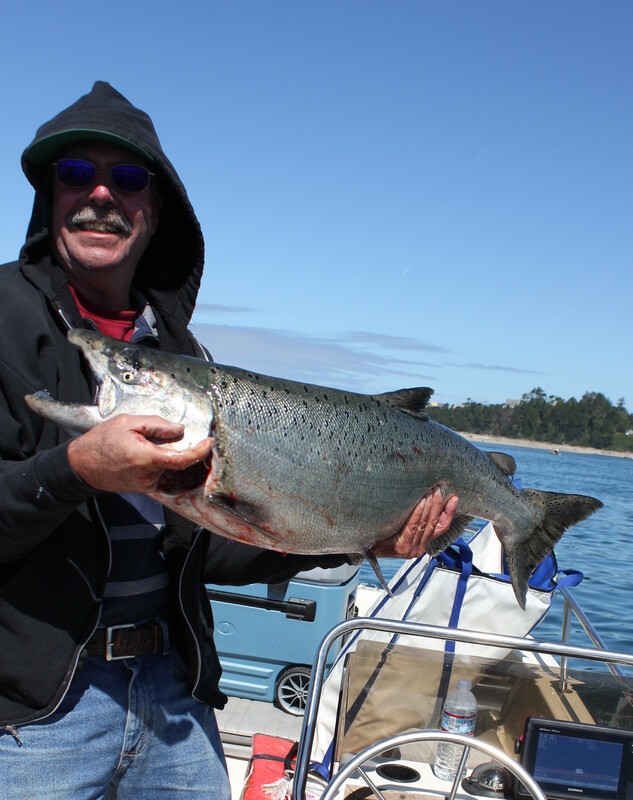 Weighing the Salmon ~ That’s One Happy Man! Recently my meals have taken on a “keep-it-simple” theme, which includes finding and making new meals that only use one pot, pan, or skillet. 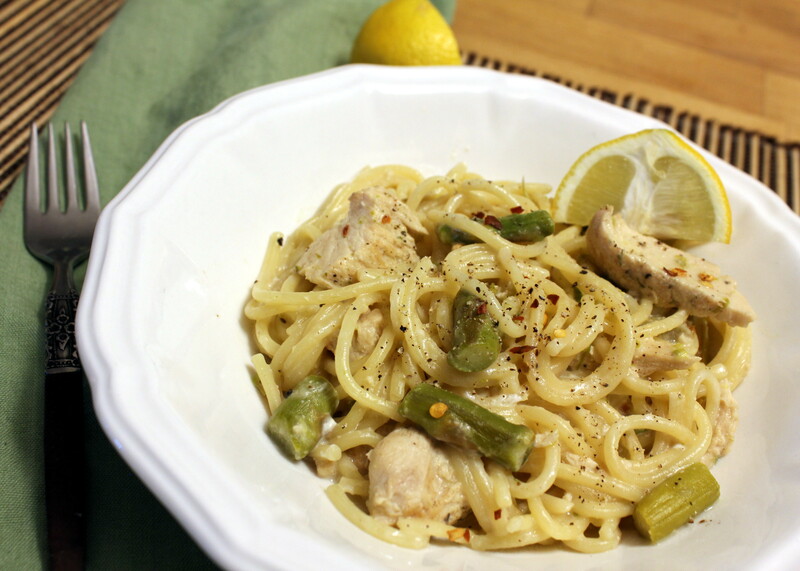 One day I was surfing Pinterest, pondering what to make with some fresh spring asparagus I had bought and came across this delightful food blog that offered just the ticket for a quick and easy meal. I scaled it down for two people as my daughter wasn’t eating at home that night, and also added some Neufchâtel cream cheese to double the creaminess. The meal offered everything it claimed, including only one pot to clean after. And the bonus? It only took a half hour to make! Two thumbs up all the way around! 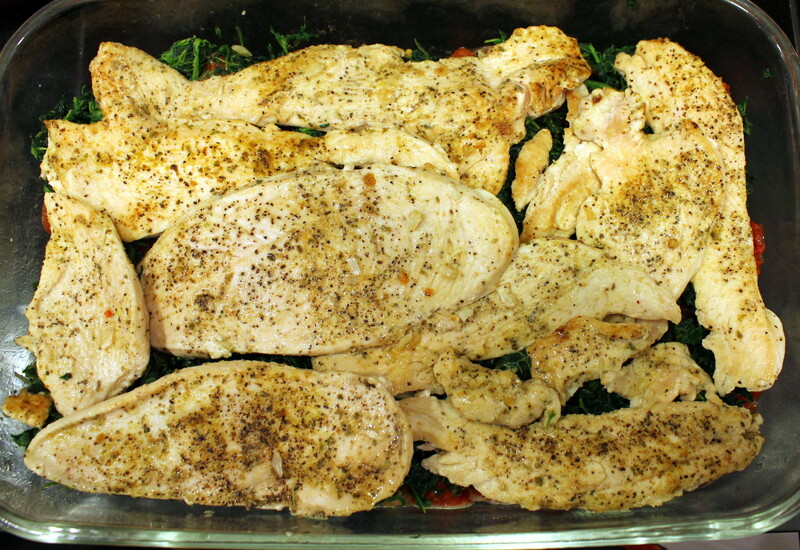 Season the chicken on both sides with ground black pepper and Mrs. Dash or salt, to taste. Heat the oil and butter in a saucepan over medium heat. Add the chicken and cook for about 7 minutes on one side, then turn chicken over and cook for another 7 minutes or until chicken is no longer pink in the middle. 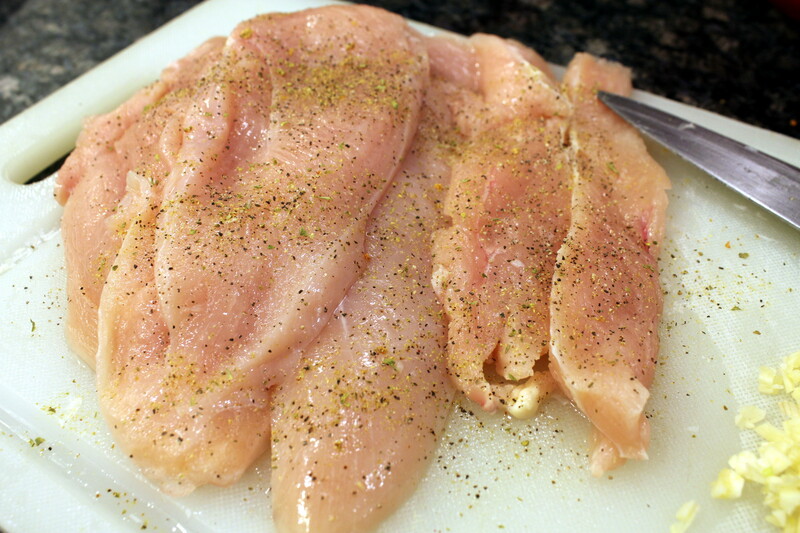 Remove chicken to a cutting board, cover with foil and let rest for 5 minutes or so. 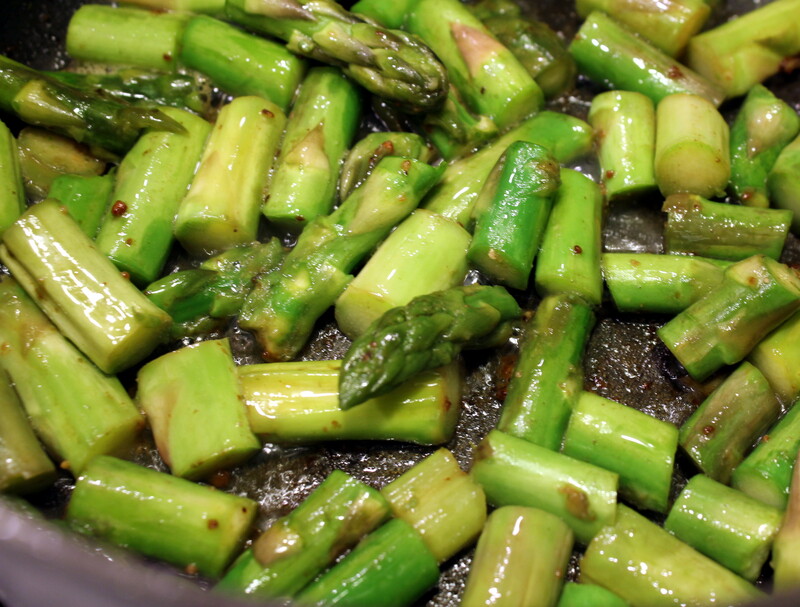 Meanwhile add the asparagus to the pot and cook for several minutes, stirring to evenly cook it. In the last minute or so, add the garlic and cook until fragrant. Deglaze the pot with a couple teaspoons of the chicken broth and scrape up the yummy browned bits from the chicken. 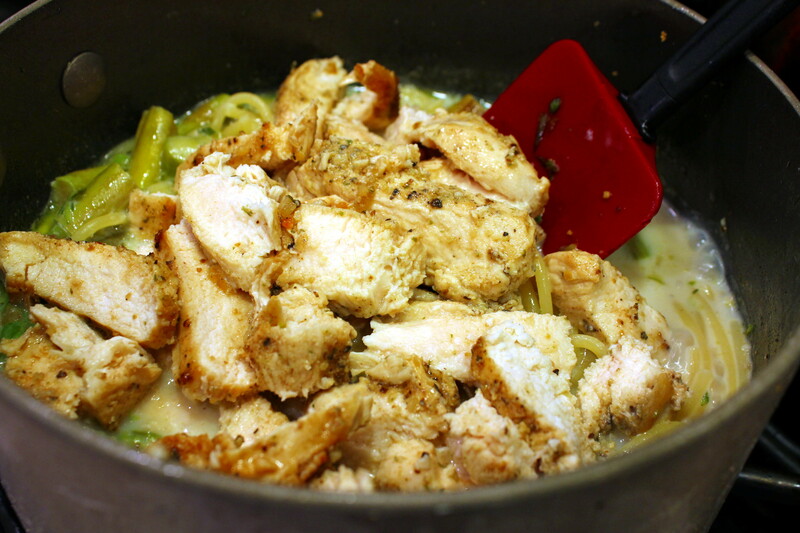 Add the thyme, additional ground black pepper, chicken broth, milk, and pasta to the pot. Turn the heat up to medium high and bring up to a boil. 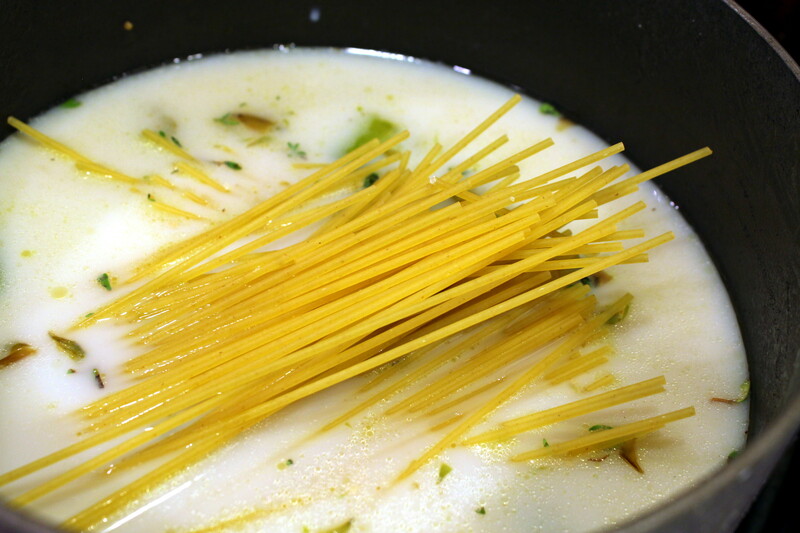 Once boiling, turn heat down to medium and gently boil, stirring often with a fork to keep the noodles from sticking to each other. Simmer for 8 to 15 minutes (we live at high altitude so pasta takes longer) until pasta is cooked to your liking. Meanwhile slice the chicken into strips then cut into bite-sized pieces. 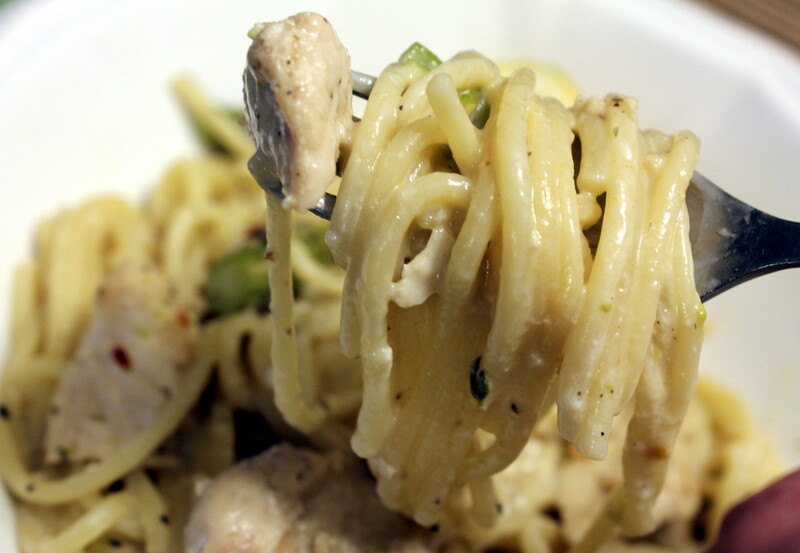 When pasta is done, add the lemon juice, Parmesan cheese, Neufchâtel or cream cheese, and chicken. 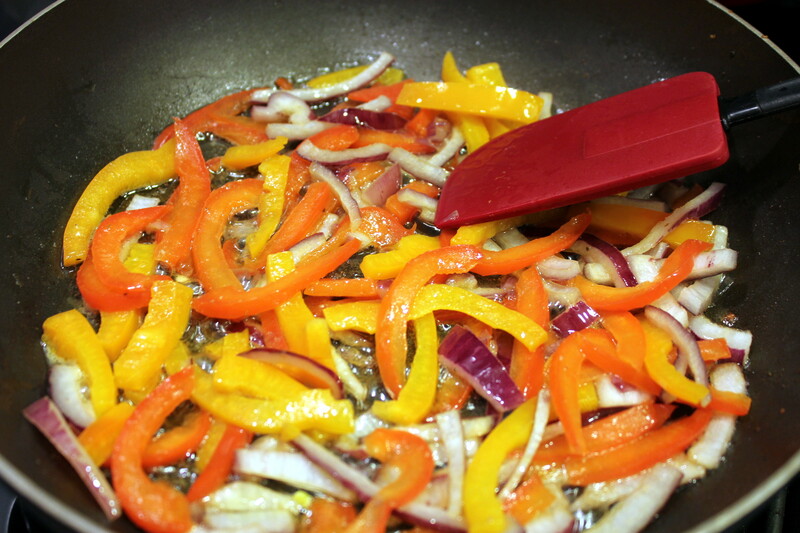 Stir to completely combine then top with a pinch of crushed red pepper flakes. Serve in bowls along with a side salad. So delicious! Note: This recipe can easily be double or tripled, use size of pot accordingly. I wanted to use both Oyster and Shitake fresh mushrooms for this, but the dang bin at the store was cleared out of Shitake when I went there. So I got some baby Bellas instead. I’m finally back in the kitchen and this sounded like a great side to some quick pan-seared chicken Parmesan cutlets I had planned on making. I made a slight oops on the amount of liquid per rice, but was able to boil it down to reduce the sauce in the risotto. It was still a bit soupy but we were all hungry. I have adjusted the recipe below accordingly. I’m glad to be back in the kitchen, I tell you. Back issues are getting resolved now and all that. My daughter doesn’t like mushrooms so she picked them out of the risotto, but she ended up going back for two helpings of it! She also said the chicken was fantastic and wanted me to make it again although it was not a “recipe” per se. Just some seasonings, cutlets dredged in milk then coated with Panko and Parmesan. Sometimes kids are just that easy to please! Note: This is made in a pressure cooker. If you don’t have a pressure cooker, the method to make stovetop risotto is widely available on the internet. Heat your pressure cooker (at minimum 3-quart size) over medium-high heat. 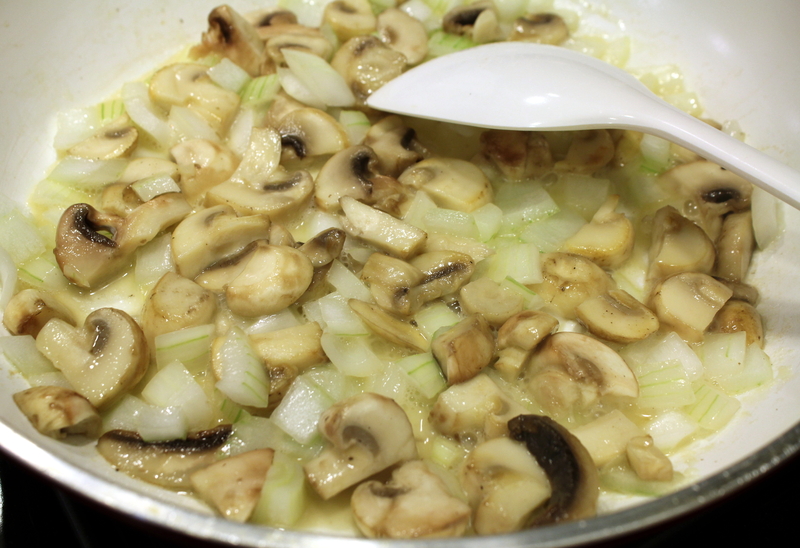 Add 2 tablespoons of the butter, then add the chopped onions and mushrooms. Cook until soft, about 5 minutes. Add the dry white wine and bring to a boil. Boil for a few minutes more then add the rice, the chicken broth, and the sprigs of thyme. Put on the lid to your pressure cooker and lock into place, then bring up the pressure to high according to manufacturer’s directions. At the end of the 7 minute-timer, remove pressure cooker from heat and run the pot under cold water to release the pressure immediately. (Or if you have an electronic one, release pressure according to manufacturer’s directions.) Don’t remove the lid until all pressure is released. 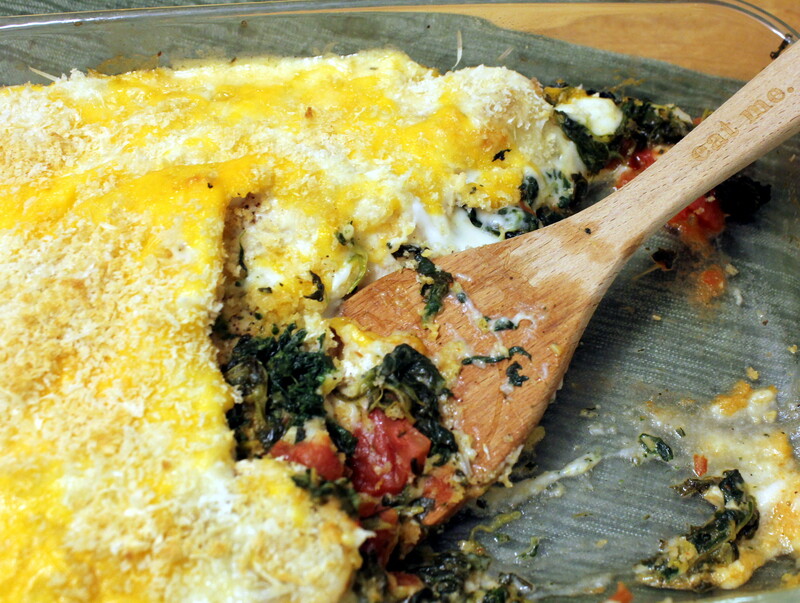 Serve with additional grated Parmesan cheese if you want and your protein of choice. Flavor bombs, I tell you, and it’s no joke when I say these are da’ bomb! These large puppies are not only packed with flavor, they are the size of small cannon balls. I was searching the interwebz for something to make with my half-priced pound of ground turkey I found in the Reduce for Immediate Sale bin at the grocery, and came across several recipes for ground turkey meatballs. The thing is, I didn’t have all the ingredients for any single one, so did was I always do. I printed them all out, and mish-mashed them together to come up with this. BONUS: Earlier in the week I had made some homemade croutons from roasted garlic-infused olive oil and grated Parmesan. I used leftover bread I took home from our company party. They ground up in my Ninja perfectly to use as a binder for the meatballs. Keeping the roasted garlic theme in mind, I did a quick roast of three large cloves of garlic in my toaster oven for 20 minutes. SECOND BONUS: The night before I had made a huge batch of our favorite side dish to go with whatever the heck meat we had (See I love these so much that I can’t even remember what I ate with them as in my mind they are the star of any meal.) I had plenty of this rosemary bliss to serve with the meatballs, so of course I carried the rosemary theme through to the meatballs. Recipe here ——–> Rosemary and Butter Red Potatoes and Green Beans. UN-BONUS: Sometimes my math isn’t so good. I was trying to figure out how long to set the timer so I could take the meatballs out of the oven about 5 minutes before they were done to zest some Parmesan over the top of them. I usually cook meatloaf about an hour, but figured I would check them with an instant-read thermometer at 30 minutes. So. I set the timer for 40 minutes. Why? I have no clue. Slightly on the dry side, but the spinach did help a lot with keeping them from being a disaster. The pan juices in the casserole dish poured over was also a perfect remedy. Wrap the garlic cloves in foil and roast for 20 minutes in a 400-degree oven (toaster oven is more economical). Remove and let cool, then peel and mince. 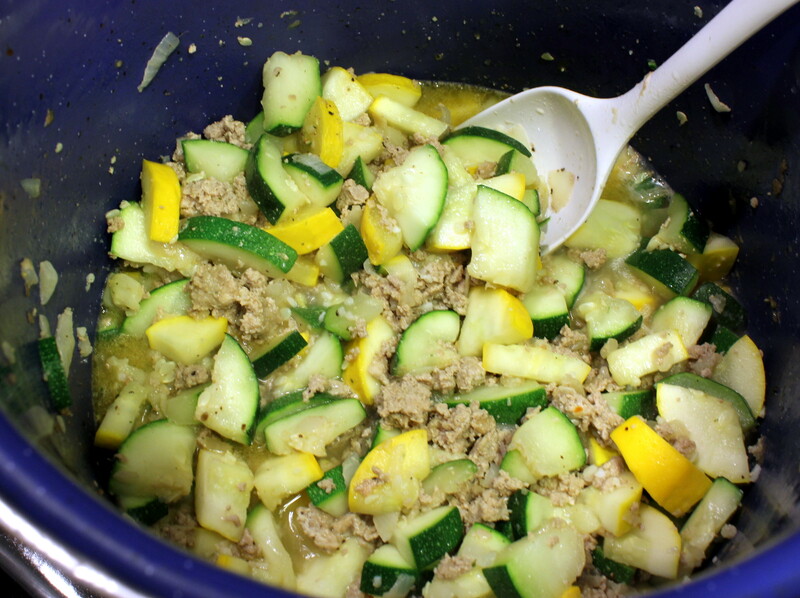 Add all the ingredients to a large bowl and get ready to mess up your hands. Thoroughly combine all the ingredients using both hands. When completely combined, scoop out a large handful and roll around in your hands and shape into the size of a large golf ball or small tennis ball. (What is that size? A rubber squash ball?) Either way, you should end up with six fairly same-sized meatballs. Place the meatballs in a small oil-sprayed baking dish and cover tightly with foil. Bake for 25 minutes (not 40 please) or until an instant-read thermometer reads 160 degrees. Remove foil then grate some fresh Parmesan cheese over top. Cook for another 5 minutes until cheese is melted and slightly browned. Serve immediately with any sides of choice. But then we got this GINORMOUS zucchini. 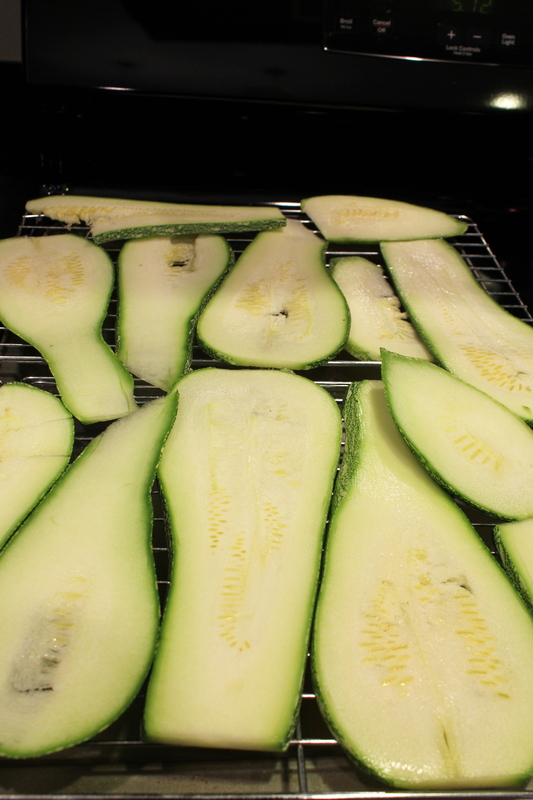 Sooo, I wanted to grill the zuke first, because of all the thousand (exaggerated) Pinterest posts about this, they were all saying it came out too watery. 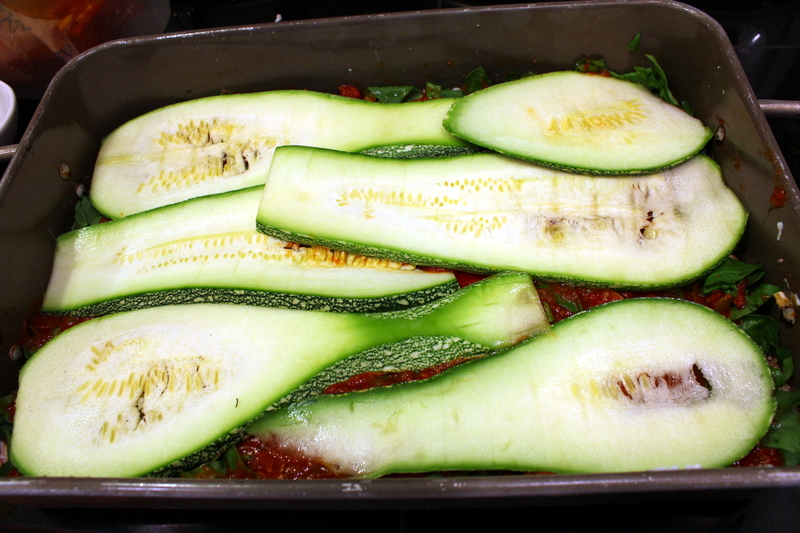 But one post caught my eye that grilling the zucchini first worked way better than doing the salting and resting thing. WELL. That didn’t work out so well. We had run out of propane, and hubby was supposed to get it but he didn’t. So it ended up doing the salting and resting thing. It came out a bit watery, but the taste was AMAZING! I went back for seconds and thirds. I think I want to make a soup out of this instead of a lasagna next time. That way I can have a really thick soup instead of a watery lasagna? What do you think? 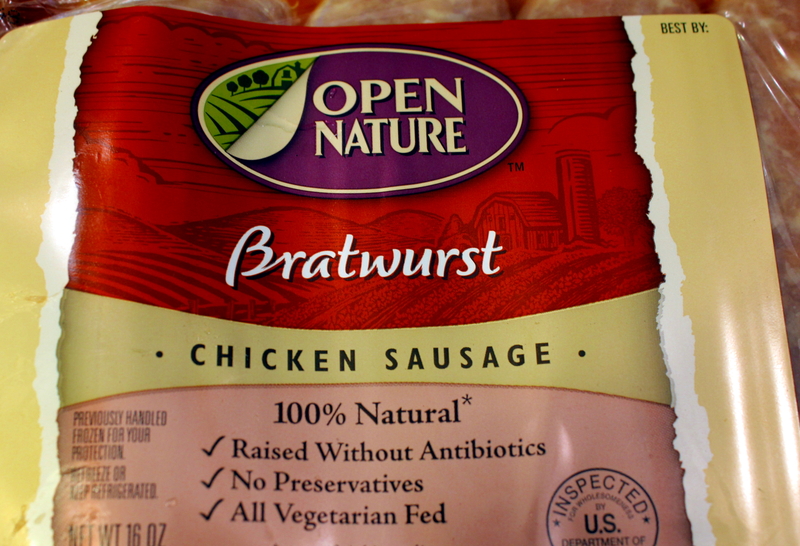 This has a super-short ingredient list (for me at least) so it’s sure to please! 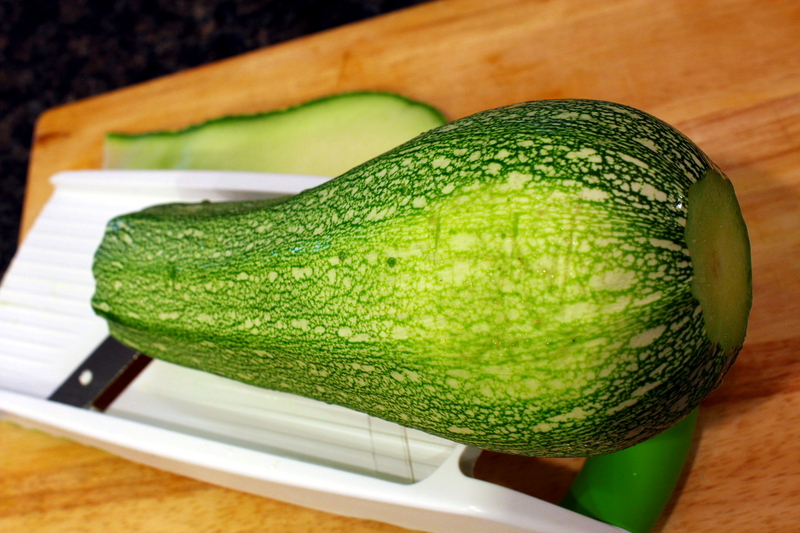 Slice your Big-A zucchini 1/8-inch thin with either a mandoline slicer or a knife. You’ll want enough to cover two-layers in a 9- x 13-inch pan. Lay the slices on racks and lightly salt each side. 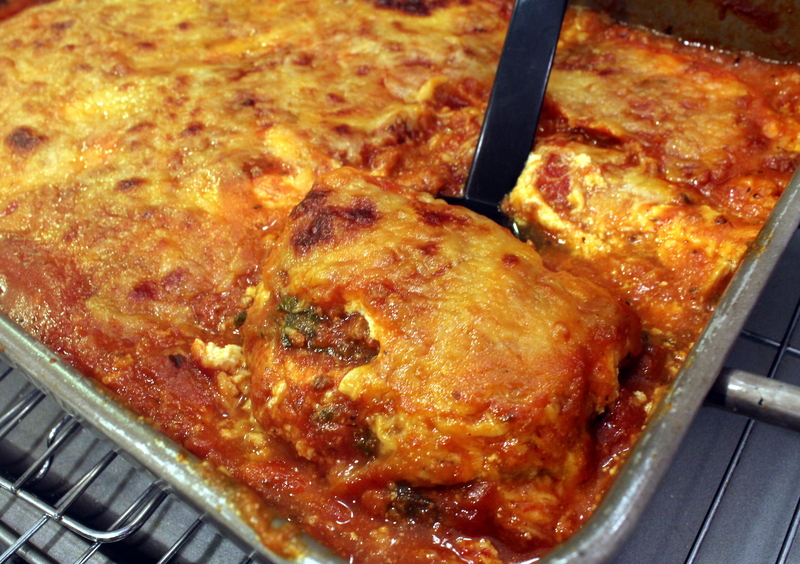 In a bowl, mix the Ricotta and Parmesan cheeses along with the large egg until combined. 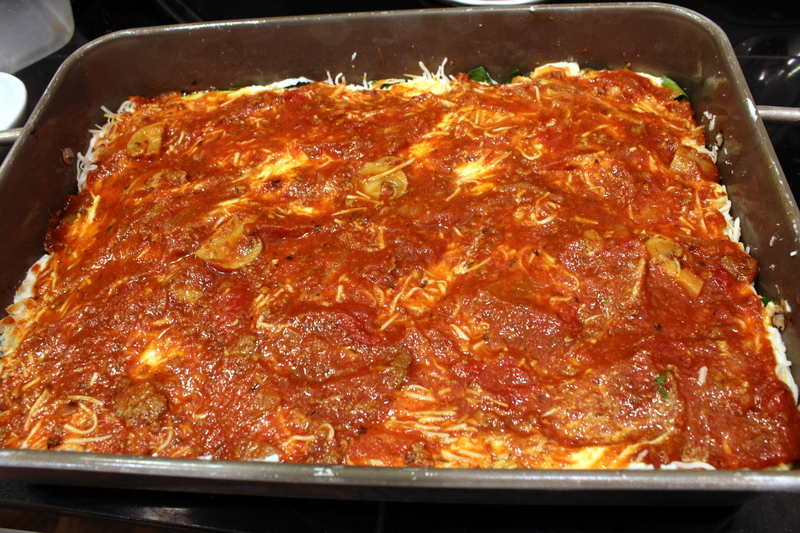 In a 9- x 13-inch pan, spread about a cup of the spaghetti sauce over the bottom. 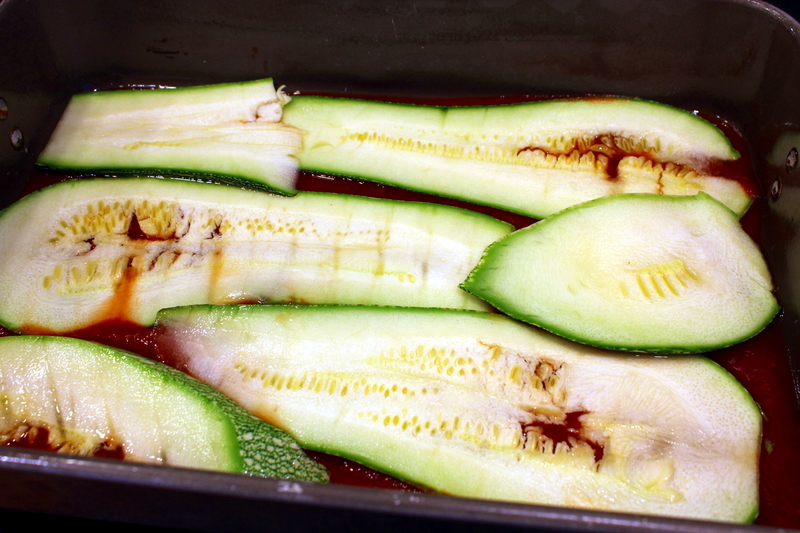 Layer zucchini slices to cover. and top with a third of the Mozzarella cheese. and top with 1 1/2 cups sauce. and the rest of the sauce. 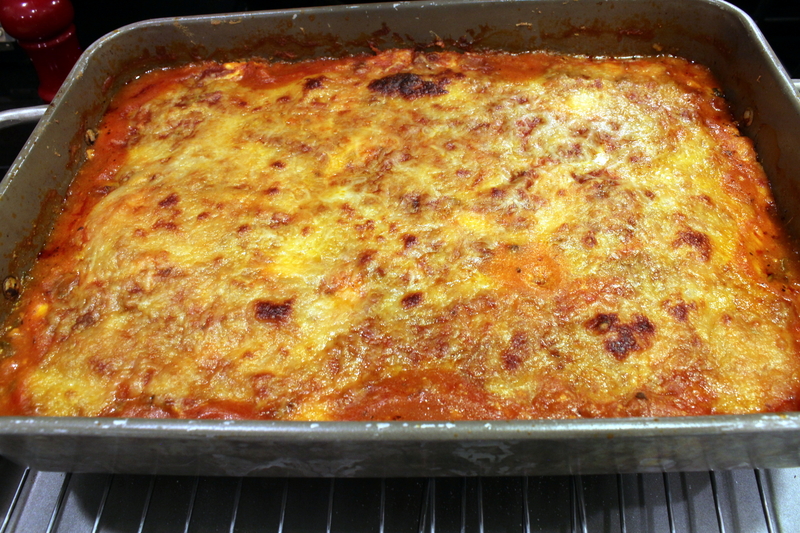 Top with a final layer of Mozzarella. Cover the pan tightly with foil and bake for 50 minutes. Uncover and bake an additional 10 minutes. Let rest for 10 minutes before serving. 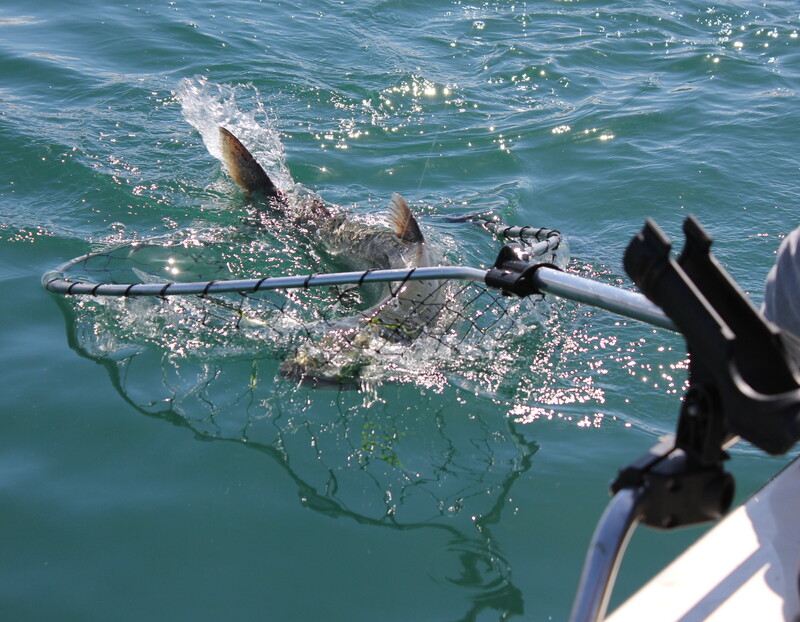 Busy, busy, busy! That’s what I’ve been lately, and when you’re busy it’s so nice to have a fairly quick and healthy casserole to whip together, just like this one. 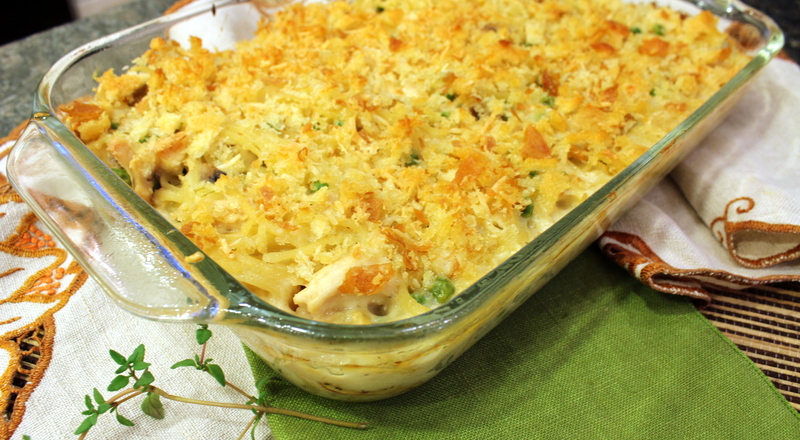 This is even something I wouldn’t mind cooking myself on this Mother’s Day (as long as I don’t have to do the dishes!). 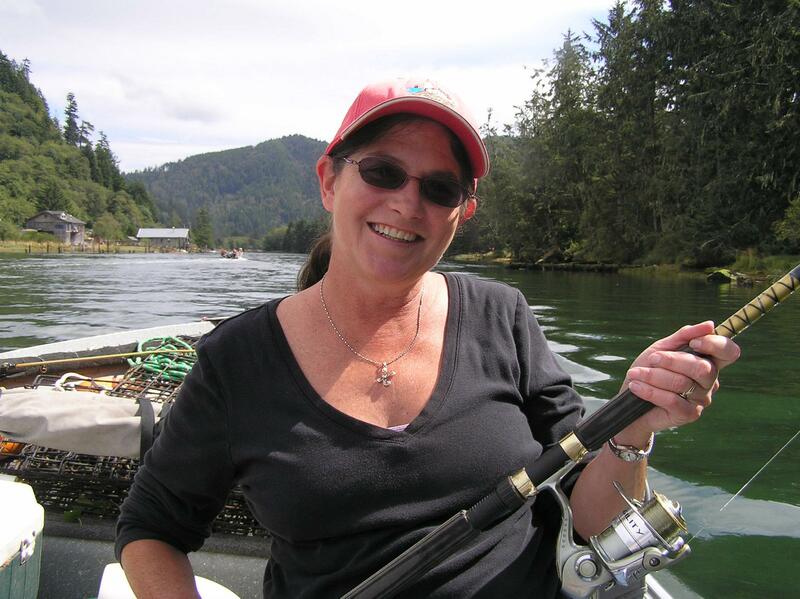 And Happy Mother’s Day to all mothers out there, be it mothers of humans, fur-kids, or nature! 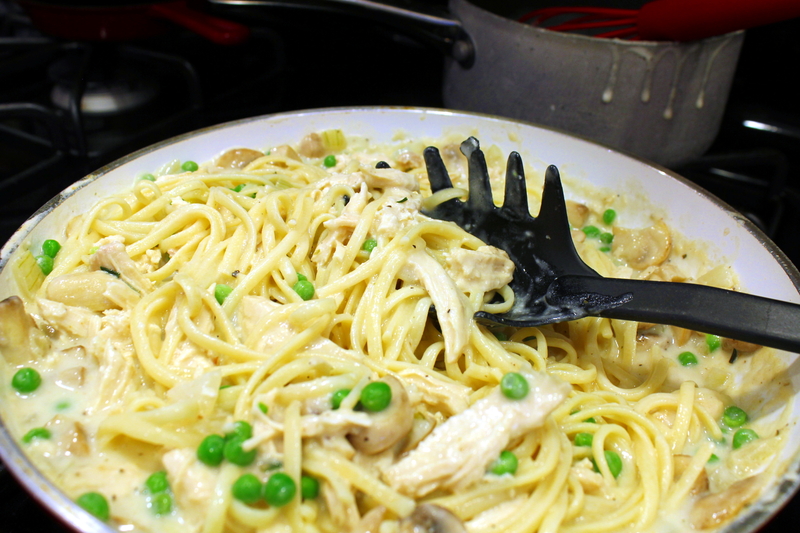 I hope you enjoy this recipe, this was a thumbs-up in my family all the way around. Preheat oven to 375 degrees. Cook the pasta according to package directions, drain, and set aside. Meanwhile, melt half the butter in a saucepan over medium heat. Stir in the flour and whisk for a couple of minutes until all combined. 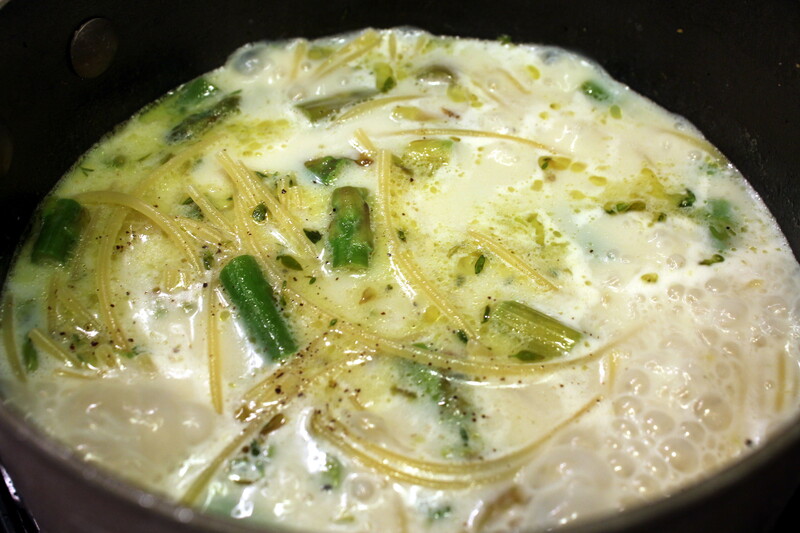 Pour in the chicken broth and milk, whisking constantly. Bring up to a boil, then reduce heat and simmer 5 minutes, whisking occasionally. 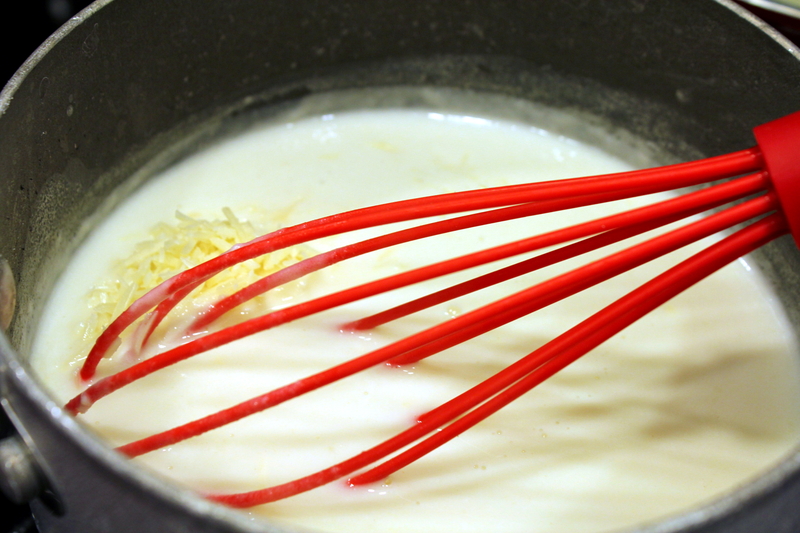 Stir in 1/4 cup of Parmesan cheese and the cream cheese until combined, then turn off heat and set aside. In a large skillet over medium-high heat, add the rest of the butter. Add the mushrooms and saute for 3 to 5 minutes. Then add the onions, garlic, and thyme and saute for 5 more minutes. Add the sherry, then cook for a minute more. 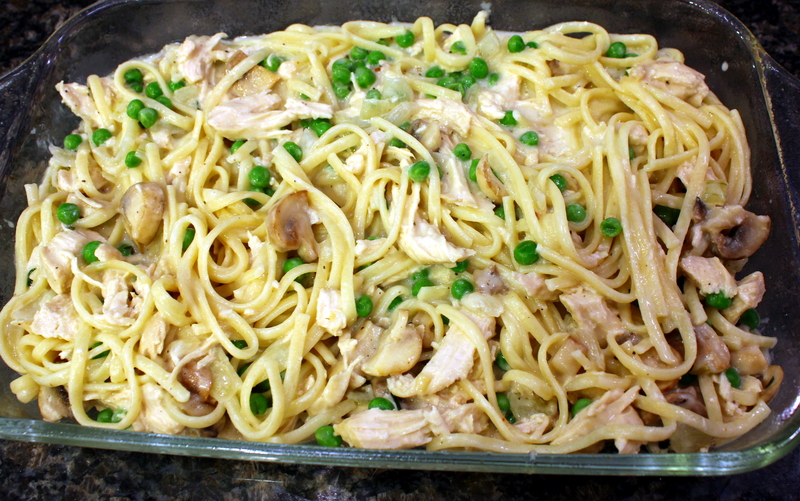 Pour in the saucepan of milk/cheese mixture, the pasta, chicken, and peas. Toss to combine. Spoon the mixture into a 2-quart casserole coated with oil spray. Place the torn bread pieces and the rest of the Parmesan cheese in a food processor and pulse until coarse crumbs form. Sprinkle evenly over the pasta. Bake for 30 minutes or until browned and bubbly. 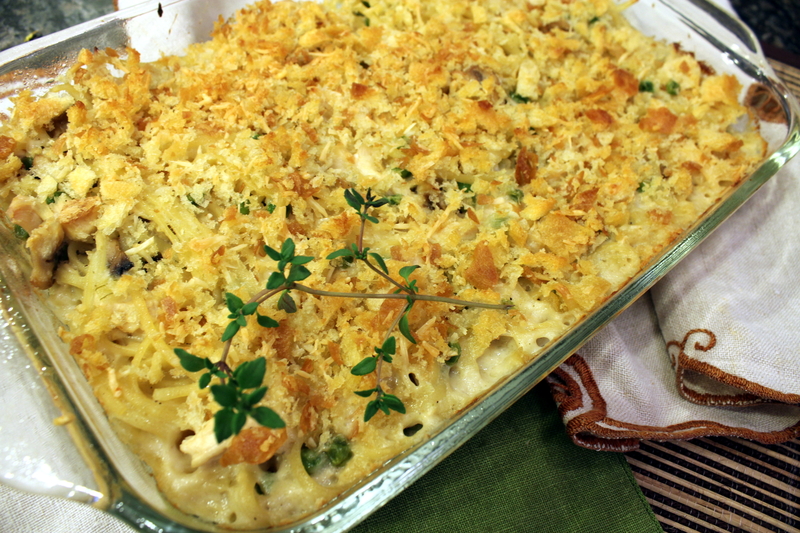 I “borrowed” this recipe from my foodie blogging friend Seana over at Cottage Grove House. Her recipes have never failed me, and this one didn’t either. 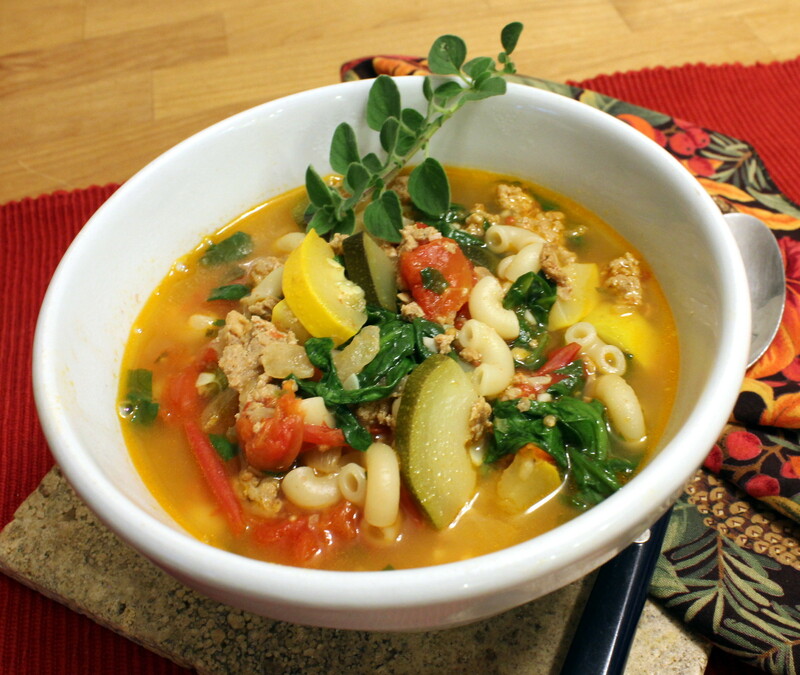 The flavors in this are bright and flavorful! 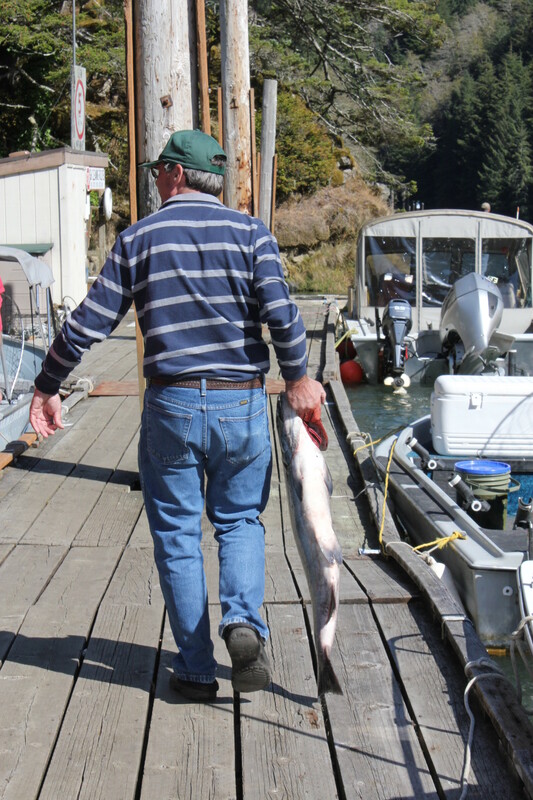 If we hadn’t left town for a couple of days this would have been completely consumed. The original recipe called for almond meal and nutritional yeast, but since I couldn’t find either of those I subbed in with ground roasted almonds and shredded Parmesan cheese. Preheat oven to 375°F. In a large bowl, toss the cauliflower florets with the minced garlic and 1 1/2 tablespoons olive oil. Spread the cauliflower on a baking sheet and roast for approximately 20 minutes, turning them over halfway through cooking time. 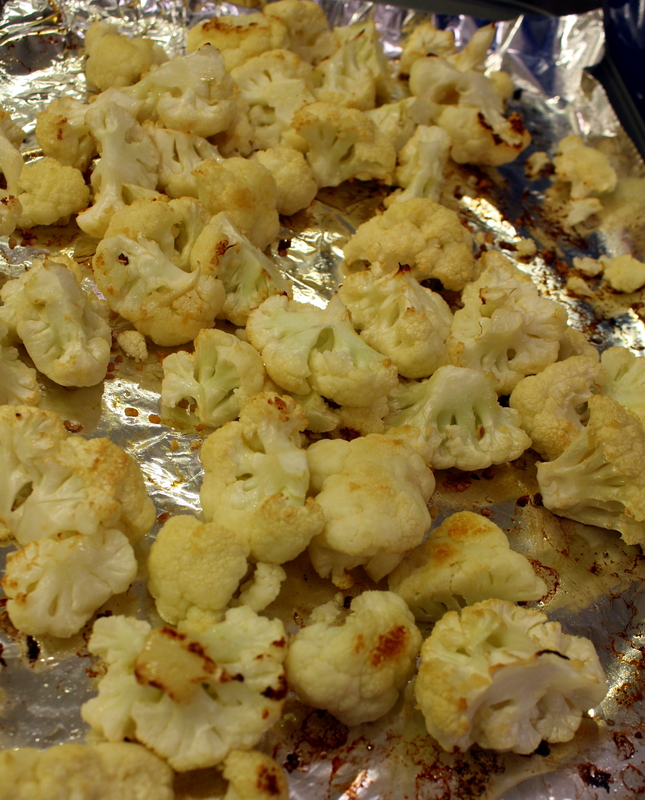 When the cauliflower is lightly browned, remove from the oven and set aside. 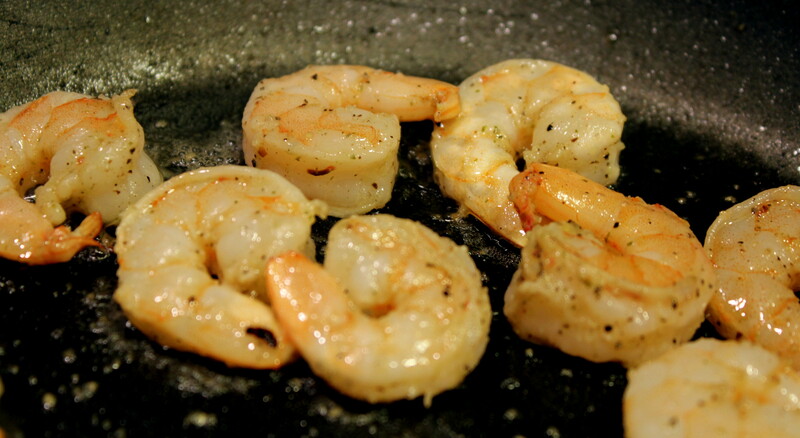 Heat the remaining tablespoon of olive oil in a large skillet over medium high heat. 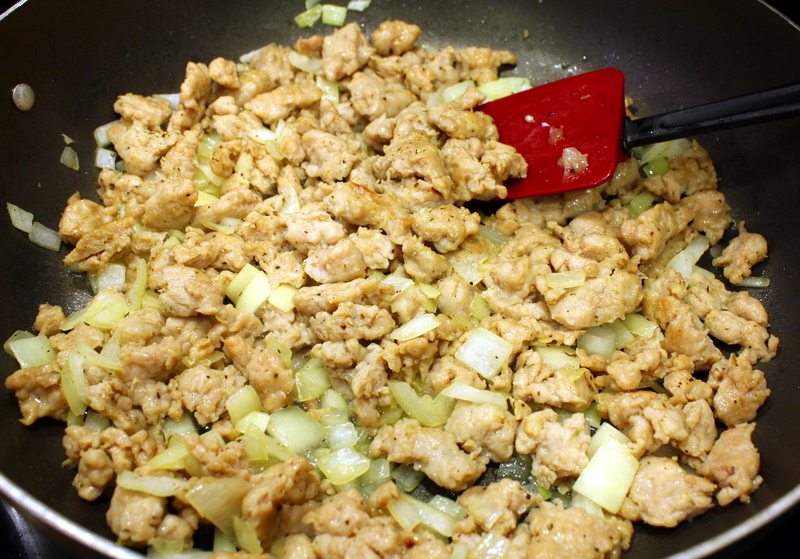 Add the chicken sausage, breaking it up as you add it. 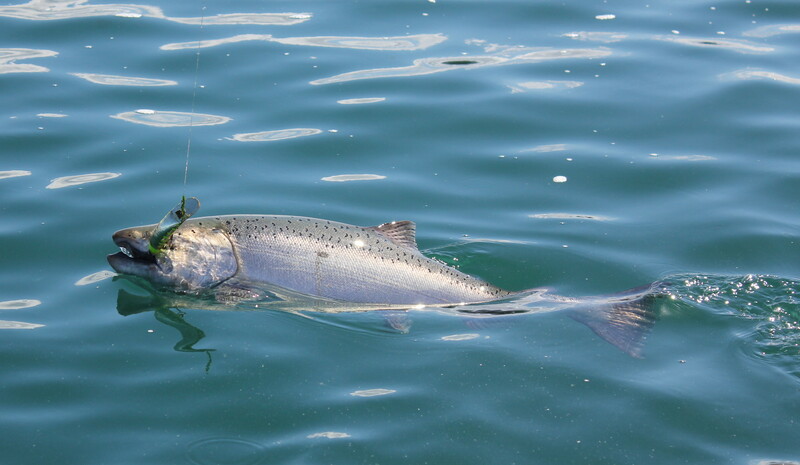 Cook for 10 to 12 minutes until it is cooked through and browned thoroughly. Lower the heat to medium low and add the onions, and thyme. Sauté the mixture for about 5 to 7 minutes until the onions have started to soften. 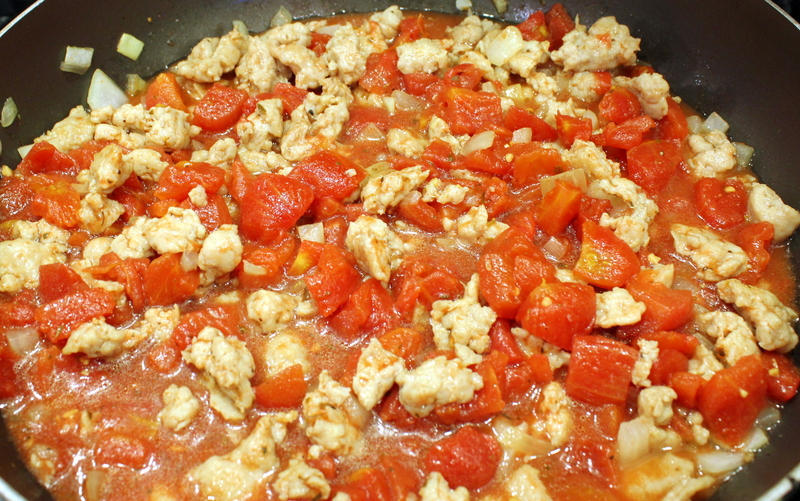 Add the Italian diced tomatoes to the skillet, with its liquid. Stir thoroughly and cook for 5 more minutes. Add salt and pepper to taste. 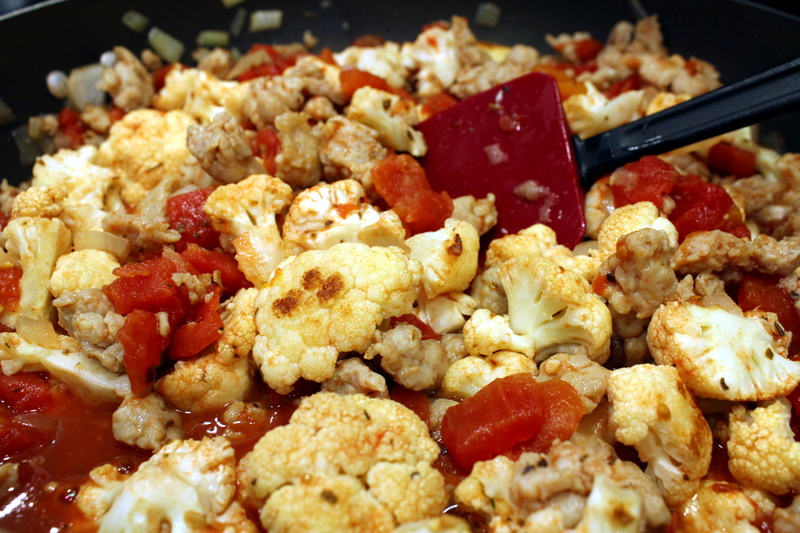 Last, stir in the cauliflower until all pieces are coated with the tomato liquid. 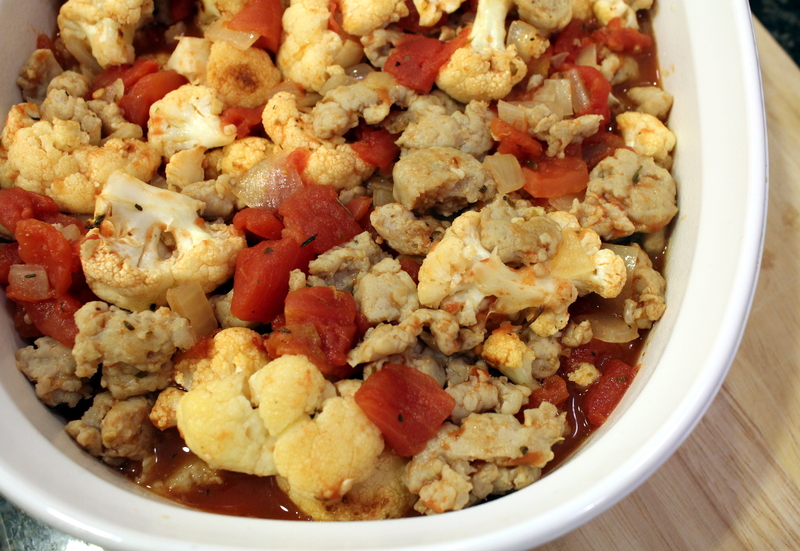 Spray a 3-quart casserole with olive oil and pour the cauliflower and sausage mixture into the dish. 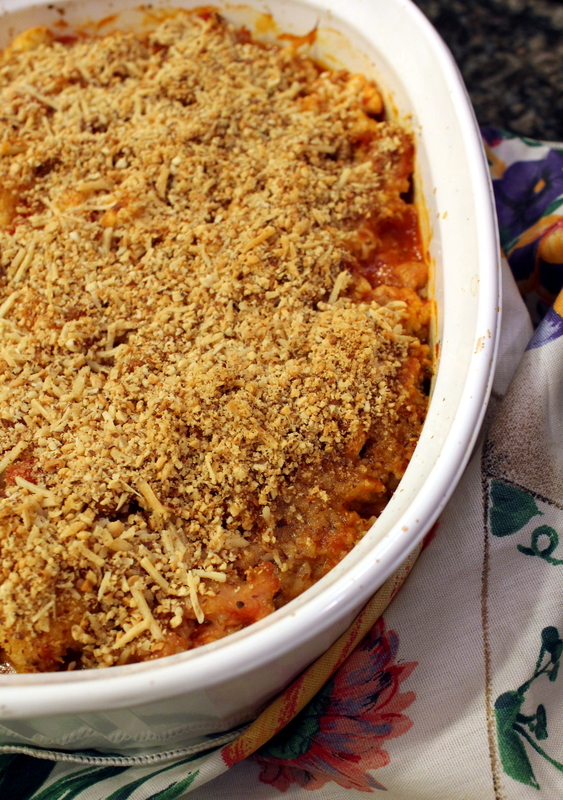 In a small bowl combine the ground almonds and Parmesan cheese and distribute evenly over the casserole. Place in the oven and bake for 25 minutes. Remove and let stand for 5 minutes before serving.